Considered by many to be one of the most beautiful of sea turtles for their colorful shells, the hawksbill, is found in tropical waters around the world; most heavily populated in Australian waters. Not particularly large compared to other sea turtles; hawksbills grow up to about 45 inches in shell length and 150 pounds in weight. While young, their carapace, or upper shell, is heart-shaped, and as they mature it elongates further. The hawksbill is a small to medium sized marine turtle, having an elongated oval shell with overlapping scutes on the carapace, and a moderately small head with a distinctive hawk type beak; with flippers and two claws. Common coloration is brown with frequent splashes of yellow, orange, or reddish-brown on the carapace. The plastron is yellow with black spots on the intergular and postanal scutes. Their habitat is shallow, murky, inshore waters, unlike other sea turtles which live in clear coastal waters. They spend their time in coral reefs, rocky areas, lagoons, mangroves, oceanic islands, and shallow coastal areas. Hawksbills frequent rocky areas, coral reefs, shallow coastal areas, lagoons or oceanic islands, and narrow creeks and passes. They are seldom seen in water deeper than sixty five feet. Hawksbills help maintain the health of coral reefs. As they remove prey such as, sponges from the reef’s surface during feeding; they also provide better access for reef fish to feed, helping other marine life. They also have a cultural significance, and tourism value. For example, the local residents in the Coral Triangle, who gladly welcome the flow of visitors who come to admire the turtles; which is a vital source of income in their economy. They are predators that feed on reefs for their favorite food, sponges, as well as a variety of other invertebrates that they find. Unlike other sea turtle species, which may cross entire ocean basins several times throughout their lifetime, hawksbill turtles have home reefs, with excellent hiding places, where they spend much of their adult lives. The hawksbill is found in tropical and subtropical regions of the Atlantic, Pacific, and Indian Oceans. The species is widely distributed in the Caribbean Sea and western Atlantic Ocean. Females lay about four times per season. The eggs hatch in about forty five to fifty five days. When the hatchlings emerge, they are larger than most species. They also reach sexual maturity earlier than other turtles. Hawksbill turtles spend almost all of their time in the ocean and females come to shore only to lay eggs. For that reason, from the time they hatch and enter the surf, males will never be out of the water again; and are therefore more difficult to study than females. Like other marine turtles, female hawksbill turtles return to the same beach where they hatched to nest, even if that beach is far from their foraging grounds. Other species of sea turtles often return to a relatively small number of nesting areas along with thousands of other adults. Hawksbill turtles tend to nest higher on the beach than other species, sometimes under the vegetation on the shore. Nesting can take between one to three hours. The female turtle drags herself up the beach, then hollows out a pit with her back legs, and deposits about fifty to two hundred eggs the size of golf balls. Much of scientists’ knowledge of hawksbill turtles is a result of studying the females when they come ashore. 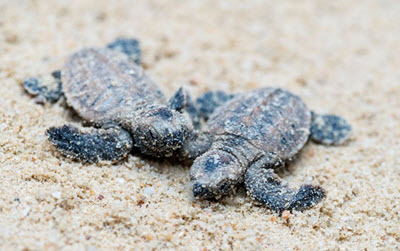 In several weeks, the baby hawksbill turtles hatch, and enter the water together to begin their journey toward adulthood. Unfortunately, there are many threats to hawksbill turtle populations, and scientists consider this species to be critically endangered and are likely candidates to extinction. Coastal development has reduced the area where they can successfully nest; dogs and other animals often destroy their nests, and people harvest their eggs for food. Despite their current protection under the Convention on International Trade in Endangered Species of Wild Fauna and Flora (CITES), and many other national laws, there is still a frighteningly large amount of illegal trade in hawksbill shells, and products. They are much hunted throughout the tropics for their beautiful brown and yellow carapace plates that are manufactured into tortoiseshell items for jewelry, or ornaments. In recent decades, eastern Asia has provided an eager market for tortoiseshell. The decline of this species is primarily due to human exploitation for tortoiseshell. While the legal hawksbill shell trade ended when Japan agreed to stop importing shell in 1993, a significant illegal trade continues.